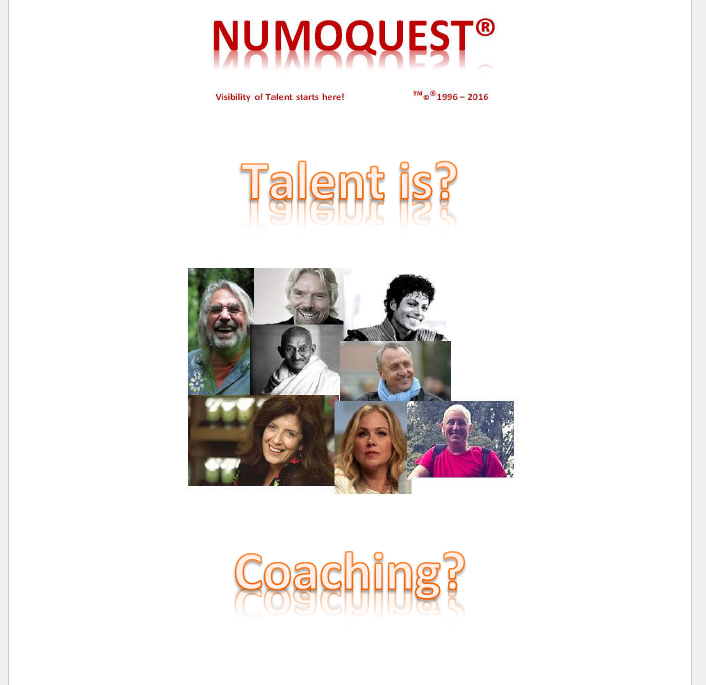 NumoQuest® Het Snelst Onafhankelijke Assessment voor Executive Recruiter, Coach en Persoonlijke Ontwikkeling. The present schemes, tests, multiple choice lists out there all pretending to be able to tell you, what character or 'talent' is, in the person of interest, for 95% of all instances rely on the availability and participation of the person of interest. The second is that one only has a momentum, not a reliable reflection of the real person of interest. NumoQuest® in the world top 5% is able to deliver natural insight and Soft Skills of the Person of interest without the availability of the person of interest nor using its active participation in the overall. Virtually all methods used today are, for over 90%, coming from the same sources, and later 'tailored' for any kind of background or objective. Naturally all posing to be 'THE' best way, mean, method course, objective sometimes pretending to have all answers. Well let's be frank about that..... They're NOT! 1. Every method above mentioned needs the person of interest to create an, or come to any assessment. Tricky, since the input required by the Person of Interest is often prejudice and hardly checked. Depending the background of the assessment the person of Interest will either provide input where no professional can guarantee that provide input is flawless. And of course many of the professionals involved have no frame of reference, being able to weigh or assess if the input provided is concise or not. Since often there is a clear purpose or desire at hand in the situation, the Person of Interest usually have no problem to provide input that is hardly controlable or consistent. 2. Professionals assessing the input have no independent weigh nor uniform assessment method or measure to assure the input is valid or true. Mind you that in the world of assessments there may be 1001 certified ways, methods, certified or uncertified, of assessment without any guarantee at all that outcome of the particular assessments truly is what is or expected. No right minded profesional will admitt to have failed here naturally. Virtually te vast majority of used methods and technques are copy of copiies of copies all practically deriving from two main streams. Psychology and a way of assessment created by the US. Department of Defense for military purposes. With all due respect, psychology and assessment never has been labeled as 'scientific' viable, yet, many pretend that is 'top' knotch. Derived of the bases of the US Department of Defense came an assessment methode that shortly was used to assess to which military department the Person of Interest was most suited for. That methode was short lived since it was abandoned by the US DoD only five years after. Never the less, commercial 'entities' had taken the basis of the method and after some copies of copies it now is referred to as complete and reliable? 95% of all methodes provide only a 'bias' overview of what the Person of Interest is telling, proving in terms of providing diploma's and such. It does'nt say anything about abilltie. Anything about Talent. Anything about soft skills. Rest assure, depending background and purpose, a Person of Interest will have prepared and informed itself quite well using all kinds of sources using internet or experinces from others. With Numoquest that aspect is useless. Numo provides deltailed insight of the Natural Primary and Secondary persons characterics and soft skills. After that an insight of education and experiences could be usefull. Practice has shown that many candidates have walked a 'standard' road of education, in large percentage not in line with Natural Talent. Remember the Universal 95% - 4% - 1% law? You as employer, as subject, you as coach, student, teacher, professional have no reliable mean to measure outcome from any chosen assessment method else then the word of the person of interest. In many instances a liability since many times an assessor doesn't know the Person of Interest well enough to make that judgement. Hence, the trial period was introduced. Why NumoQuest® is so very different? The strength of NumoQuest® is that the presence nor participation of the person of interest is part of the process. That is, NumoQuest® only uses available static data of that person, data that already exist an isn't been altered. Here any possibility of adjusting data or preparation is useles. Simply, there is no questionair or test to make or take. The data is processed by an automated mathematical process where non of the NumoQuest® staff plays any active role nore can manipulate. The generated output at last is only visually checked for error and possible textual inconsistency and corrected. There is no connection what so ever between the process, the staff and the person of interest. The outcome is presented as is. NumoQuest® only provides insight of natural latencies and soft skills of the person of interest visible. There is no judgment nor advise. All these combined provides an instant usable full 3D personal spectrum anyone wants to have to have insight in any persons of interests most natural competences as a guiding referral. These are the basic natural personal abilities the person of objective automatically, by heart, displays in every days activity. The insight is a complete and lasting insight, not a momentum. Why invent if the objective for any purpose already is there? An instant and completely independent assessment is there to put to use or to decide if a candidate is suited for any role or position. In instant and independent insight is provided to those want to know more of one self and ones personal behavior and interaction with others. NumoQuest® doesn't recognize the fact that any one is capable to learn everything. Simple fact is that people are unique and vary in natural born skills and back grounds. There for NumoQuest® is able to differentiate each and individual leaning direction best and provide that insight for everybody concerned in that prodcess. There is an abundance of coaching techniques, some even counterproductive. There is virtually not really an acceptable standard to use since every coach is different, with different objectives and even as person often not really connected to protégé or pupil. NumoQuest® provides the most important and instant usable insight in the personality of protege or pupil where can be swiftly decided on approach and strategy or even to abandon an certain area, specialization or sport. Valuable time, costs, agony and frustration instantly can be avoided. Also in the fields of psychiatry and psychology and other where professionals are engaged in aiding and support people, clear direction is desired. In stead of lengthy debate sessions to come to conclusions, that strategy now can be abandoned. NumoQuest® 's objective sole is to focus on each persons natural born abilities where the response is swift and recognizable for the person of concern. Rather then inventing all kind of costly strategies, here the bases of the personality becomes the objective for all in the process. Why change the natural abilities of people knowing they always will return by heart to their individual natural characteristics? NumoQuest® is not a medicine or treatment. NumoQuest® sole purpose is to make indvidual personal natural latency, capacity and soft skills visible to use in any desired objective. Excluded for use for individuals with mental defects by nature and in case of use of medication with impact on personality and personal behavior to widest extent.